Y'all know how much I love my Jams! So when I was prepping my pack list for Walt Disney World and CTMH convention in June, I obviously needed some custom CTMH Jams, right? 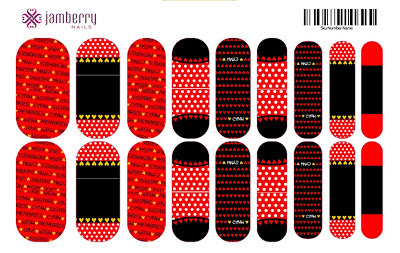 I designed these in Publisher and will be ordering then through the Jamberry Nail Art Studio next week on Friday. You want some too? Fab - I'm ready to share my mixed mani CTMH nail art! I've got a couple of heart themed french tips, a CTMH love/heart stripe, a diagonal CTMH/Wish/Inspire/Memories stripe, and a black and red color block that is NOT Mickey pants, y'all. We are following the copyright rules here, ladies. Since I would be ordering these for myself, I'm covering all the set up fees and shipping costs. I'm also planning to donate all profit over the cost of ordering and shipping the shields to Operation Smile, CTMH's awesome company cause. So if you want to get in on the CTMH Jamberry goodness, simply place your order through this Paypal button. Full sheets will do 2 full Mani/pedis, and Half sheets will do 1 mani/pedi. I'm getting two sets so I can wear them all through the month of June and enjoy my Convention excitement longer! I'm only going to do the one group order for these, closing on Friday May 17th. If you want them after that, I will willingly share my design with you, but you'll have to pay the set up fees and shipping. Make sure you include your address on your paypal payment - I'll be re-mailing the shields out in a special Convention Jams only card for my CTMH Jamberry friends so you can apply them before WDW (or starting your convention week twitter stalking). I can hardly wait! Squee!! I gotta have CTMH Convention Custom Jams, too! Choose your quantity! Orders due by May 17th. If you want more than one full sheet, please order more than once - I'll send you an email confirming your total number of sheets ordered. And hey - don't forget to enter my Friday Favorite Things giveaway for this week. It's one of my top ten things I love that are free!